Roaming Around East Anglia – Could A Tram/Train Run Through Felixstowe? This report on the East West Rail web site is entitled Eastern Section Prospectus and gives full details of their proposals for the Eastern section of the East-West Rail Link. This is said in the report. It is also said, that there will be a frequency of four trains per hour (tph) between Ipswich and Felixstowe. On my trip round East Anglia, I deliberately walked from the sea-front to Felixstowe station, taking these pictures. Would it be possible to run a tram-train through the town? To my mind there are three places for the tram-train to Felixstowe to terminate. This picture shows a Class 153 train in the current platform. To say that it is safe and boring would be an understatement. If the operator is running four tram-trains per hour to Felixstowe, then surely they should be taken to somewhere more interesting. So would it be possible for the tram-trains to go through the station and perhaps use a single track railway to the Town Centre? This Google Map shows the station and the old station buildings, which are now a Shopping Centre. Would it be possible for a tram-train, running as a tram to run North of the Shopping Centre and turn onto the station forecourt, from where it would go walkabout? These pictures show where the tram would run. 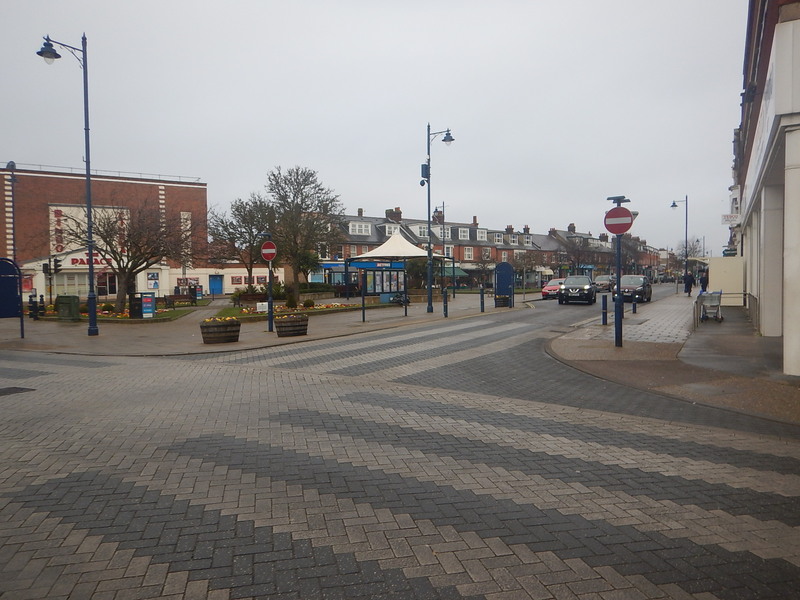 These pictures show the station buildings, which have been turned into a a Shopping Centre. It looks very much like the shops would not need to be disturbed. How Far Could The Tram-Train Go? 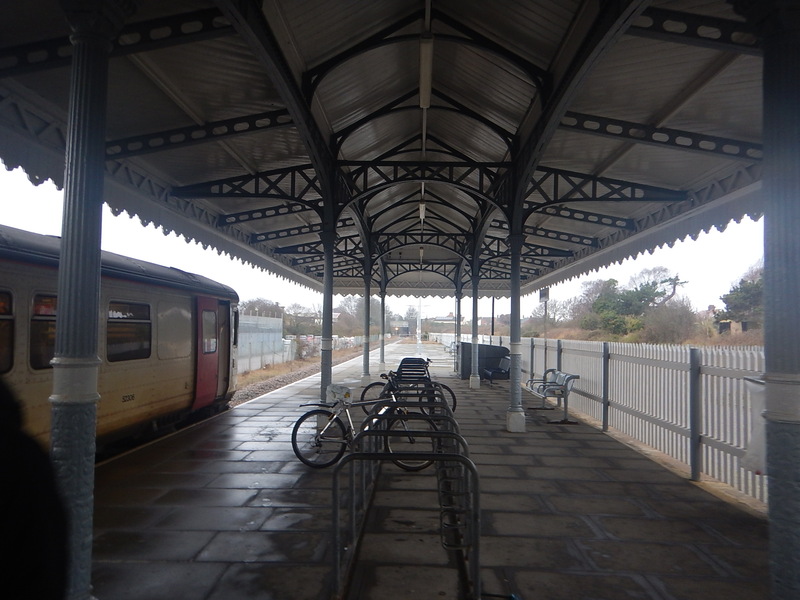 If a single-track extension were to be built through the station, the time-table could be arranged so that the outgoing and the incoming passed in the current island platform at Felixstowe station. The simplest system would be for the tram-trains to go to the shops in the Town Centre and reverse outside by the shared space. The picture shows the location. Trams would be timed to take fifteen minutes for the trip from Felixstowe station and the return. Only one tram-train would be on the single-track route at any time. Tram-trains would work on battery power. It would be a very simple use of a tram-train to move a terminus of a branch line to a better place. According to a tram driver in Sheffield, the Class 399 tram-trains as used in the City have bags of grunt and handle hills with ease. So why not run a single tram line through the Town Centre and then take the route via Convalescent Hill to the sea-front, where a terminus could be by the Pier and the Leisure Centre? The Pier stop would have the following. Two platforms, so that two tram-trains could pass. So that the single-track through the Town Centre would work, tram-trains would need to go between Felixstowe station in perhaps ten minutes. This would give ten minutes for a turnround with a charge at the Pier stop. Four tram-trains per hour between Ipswich and Felixstowe stations would need four vehicles. Extending it to Felixstowe Pier would need another two tram-trains for a similar service. A tram-train serving Felixstowe sea-front running on battery power through the Town Centre., looks to be feasible.